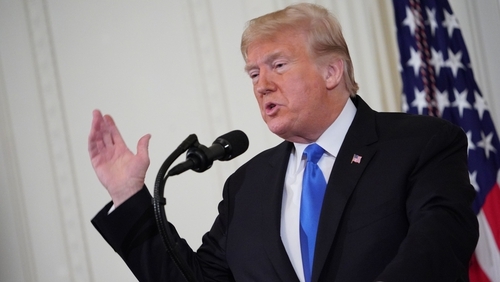 US President Donald Trump has expressed hope that Republicans and Democrats can "work together" after midterm elections that left the lower house of Congress under Democratic control. He hailed the elections as a "big day" for Republicans, despite his party losing control of the House of Representatives. The Democrats now control the lower house for the first time in eight years. With a House majority, Democrats will have the power to investigate Mr Trump's tax returns, possible business conflicts of interest and allegations involving his 2016 campaign's links to Russia. During a combative post-election news conference in which he clashed with reporters, Mr Trump trumpeted his role in Republican gains in the midterm congressional elections, and warned he would adopt a "warlike posture" if Democrats investigated him. Mr Trump warned Democrats on potential investigations, saying "They can play that game but we can play it better". But he also said that he hoped to work with the Democratic party on a number of issues including trade, the economy and healthcare. "It really could be a beautiful bipartisan situation," Mr Trump said. "Hopefully we can all work together next year to continue delivering for the American people. Including on economic growth, infrastructure, trade, lowering the cost of prescription drugs." He said Democrats House leader Nancy Pelosi, who may be the next speaker of the House, had expressed to him in a phone call a desire to work together. However, Mr Trump doubted there would be much common ground if Democrats press investigations. Ms Pelosi said Democrats in the US House of Representatives would use their newly won majority to pursue a bipartisan agenda for a country that she said had had "enough of division." Ms Pelosi is expected to seek the top job of House speaker, a post she held for four years beginning in 2007. She was the nation's first female speaker. She said House Democrats would be a check on Mr Trump, and added: "The American people want peace, they want results." A spokesperson for Ms Pelosi said Mr Trump had called her to congratulate her party on winning a House majority, and acknowledged Ms Pelosi's call for bipartisanship. White House spokeswoman Sarah Sanders said Mr Trump's agenda remained the same. She said that he would be willing to work with Democrats on immigration, the opioid crisis and funding infrastructure projects.